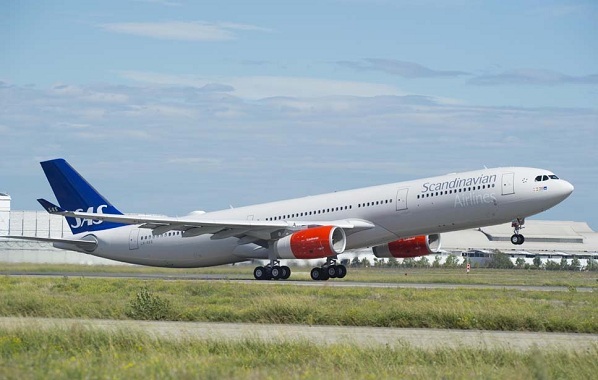 Scandinavian Airlines has become the first European airline to receive the new 242-tonne Maximum Take-Off Weight variant of the A330-300. The aircraft was delivered to SAS during a ceremony held at Airbus in Toulouse, France. SAS has selected Rolls-Royce Trent 700 engines to power its new A330-300. Launched in 2012 as Airbus’ latest evolution to the twin-engine wide-body A330 Family, the increased take-off weight A330-200 and A330-300 incorporate a new aerodynamic package, engine improvements and an optional centre fuel tank (the latter for the A330-300 version). These upgrades allow for an extended range of up to 6,100 nautical miles while offering up to two per cent less fuel burn. “At SAS our vision is to make life easier for Scandinavia’s frequent travellers and we are now delighted to welcome our passengers on board the new A330 Enhanced,” said Rickard Gustafson, president, SAS. “We are making substantial investments in our fleet and network which means that we by far have the strongest intercontinental offer to and from Scandinavia. Scandinavian Airlines is currently operating 25 A320 Family aircraft, plus four A330-300s and eight A340s. In addition, 30 A320neos are still to be delivered to SAS, along with another three A330-300s and eight A350-900 ordered in 2013.